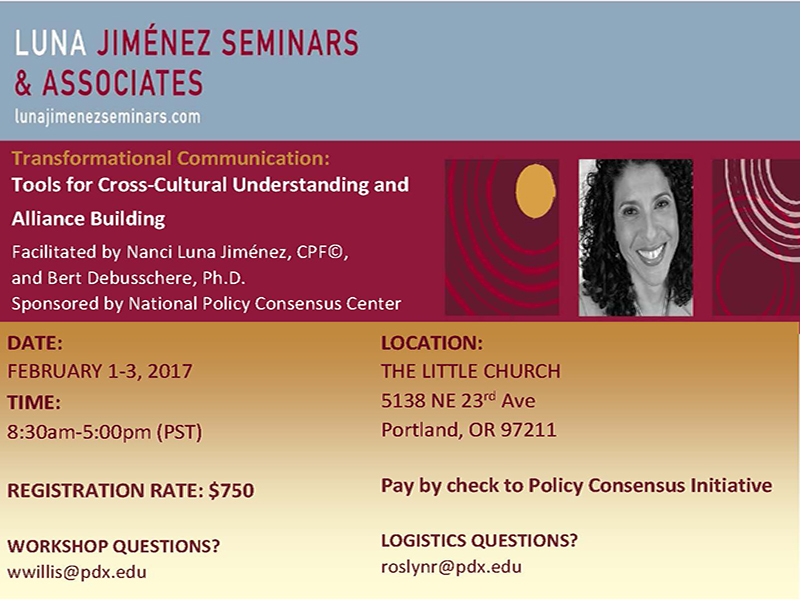 Our partners at Portland State University's National Policy Consensus Center are sponsoring a workshop "Transformational Communication: Tools for Cross-Cultural Understanding and Alliance Building" as part of our commitment to equity. From NPCC's equity statement: An important purpose of collaborative governance is to bring a full range of voices together to build on the promises of democracy. Institutional racism and other inequities hinder this aspiration from being realized. We are committed to striving for equity both in our projects and in our organizational culture. We approach this work as learners. This workshop is facilitated by Nanci Luna Jiménez, CPF©, and Bert Debusschere, Ph.D. Read about their work and approach. A new report from NPCC and PSU's Hatfield School of Government, "Advancing Collaborative Solutions: Lessons from the Oregon Sage-Grouse Conservation Partnership (SageCon)," explores lessons learned from this collaborative conservation effort. In fall 2016, Daniel Kemmis – author and long-time public servant – gave the inaugural Collaborative Governance talk sponsored by the Collaborative Governance Certificate Program at Portland State University.